With the start of direct Eurostar trains from London last May , the rebirth of this once run-down and edgy Mediterranean port is complete. Crumbling shops and factories have become cool designer B&Bs, galleries and concert halls. The famous old harbour has been renewed by Britain’s Norman Foster. And they make the perfect bouillabaisse. This is my pick from France’s new Queen of Style. This gritty, culturally-diverse city used to be known in France as , Planète Mars, to suggest a place apart, stuck out in orbit around a more grounded country. That’s all changed. One of Europe’s biggest urban regeneration schemes has transformed the rundown centre. Old industrial buildings are now shiny new galleries and performance centres. Historic areas have been spruced up. 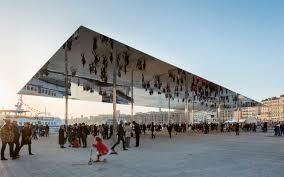 The New York Times put the city second on its bucket list in 2013, when Marseille was European Capital of Culture. Now it’s at the end of the longest direct train trip you can make from London. Eurostar started services in May (2015). At six and a half hours, it’s faster than London to Aberdeen. British architect Norman Foster was commissioned to reclaim the quaysides around the old port (Vieux Port), and tame the traffic by removing lanes from a busy road. Work was finished in 2013. Foster says he has enhanced, rather than altered, a “truly grand space”. Stroll the wide waterfront on limestone cobbles and take in public performances and events at new, informal venues. The most striking feature in the makeover is the 150 feet long “Giant Sunshade”, a thin and elegant blade of stainless steel, supported by slender pillars, keeping the sun (and rain) off performers and audience, its polished, mirrored surface reflecting the adjoining port. The true secret of bouillabaisse, Marseille‘s famous fisherman’s dish, is safe with the local chefs. By rights it should be two dishes, fish soup followed by the ingredients used to make it. For the best, book a table at one of the signatories of the original 1980 “Bouillabaisse Charter”, drawn up to halt the desecration of the dish in certain tourist restaurants.The defenders of the faith include Le Caribou, Chez Caruso, Le Miramar, Chez Fonfon, L’Epuisette, Peron and Le Rhul. Chefs must choose four fish from a list including rockfish, spider crab, red mullet, conger eel and red scorpion fish, prepare them before the customer, then add onions, tomatoes, potatoes, fennel, parsley, bouquet garni, garlic, olive oil and saffron. And, naturally, a generous glass of pastis. To hire a bike with the city’s automated scheme, Le Velo, just register with your credit card, and off you go. Not feeling so fit? There’s the usual full-on French transport system, with new trams, a Metro and buses to all points. Or take to the water. The new Frioul If Express ferry connects the old port to the nearby islands. Leaving the harbour, you pass the dazzling new Museum of European and Mediterranean Civilisations (MuCEM), gorgeously lit at night. There are conversions all over. Le Silo, a former grain elevator, is now a concert hall. An old tobacco factory and huge old air hanger became culture and events centres. The ferry continues to Château d’If, where Dantès, French fiction’s other famous prisoner (Count of Monte Cristo) after Valjean was held. The island of Frioul is good for water sports, swimming and walking. Or stay on the boat for the 75 minute round trip. Marseille was European Capital of Culture in 2013. To celebrate, a group of artists, who were also keen ramblers, created a new long distance walk. The name, Gr2013,may not be so catchy, but at 240 miles long it’s an epic trail, almost as long as Britain’s Pennine Way. It describes a huge figure of eight, centring on Marseille, and running past the airport and railway station. It passes the Etoile mountain range, the wild, craggy hills of Aubagne where French author Marcel Pagnol set his books, and Cézanne’s Mont Saint Victoire. The path takes in quiet, little-known countryside and striking urban landmarks. Set aside around 15 days to walk it, or a week if you only do one loop. Marseille has turned into an attractive short break destination, with a good choice of places to stay. Leading the list of stylish new places is the Hotel Dieu, high on a hill looking down on the Vieux Port. Once the ciy’s main hospital, this ancient structure retains its distinguished architectural detail – colossal staircases, arched galleries and vaulted passageways. There are some sparkling boutique B&Bs, imaginative conversions from rundown shops and business premises. Designer Philippe Starck created L’Hotel Mama Shelter, full of fun and lively decor. Casa Honoré is a chic four bedroom B&B, once a printing works. Pension Edelweiss is more conventionally elegant, full of mid-20th century furniture. Au Vieux Panier is in a 17th-century building that was once a Corsican bakery.